This debut album of The Danish Piano Trio presents a fascinating string of Romantic trios. From the perfectly balanced world of Danish music’s ‘godfather’ Niels W. Gade over the sensitive and dramatic turn-of-the-century art of P.E. Lange-Müller, the album concludes with the beautiful single-movement Mountain Flowers from 1908 by the hyper-Romantic prodigy Rued Langgaard. "Det er ganske enkelt en vidunderlig kammermusik-cd"
"Kammermusikken trives i bedste velgående her i landet. Nu har en helt nyetableret klavertrio set dagens lys, med tre særdeles erfarne musikere(...). De har som første udgivelse valgt at præsentere værker af Lange-Müller, Niels W. Gade og Rued Langgaard. Førstnævntes f-mol trio fra 1898 byder på dybde, mørke og drama, men også på forfinet elegance og glimt af nordisk folketone. Gades F-dur er moden sprødhed, vemod og mindre drama, glimrende ramt i de tre musikeres intense og oprigtige spil. En enkelt sats fra en ufuldendt trio af Gade kompletterer dette indtryk og fuldendes i 15-årige Rued Lang-gaards ”Fjeldblomster”, meditativ, eftertænksom senromantik så det basker. Velvalgt og oplagt idé at lade denne sats afrunde udgivelsen." "Den Danske Klavertrios ærinde ligger ligefor, og ambitionen er klog og sympatisk: De glemte danske klavertrioer skal frem i lyset. I en dynamisk vekslen mellem Lange-Müllers tusmørketrio, Gades klangperfektion og Langgaards dybe menneskelighed tegnes et portræt af triogenren. Lars Bjørnkjær, Toke Møldrup og Katrine Gislinge forstår at sætte romantikken fri på deres debut-cd. (...)"
"Den Danske Klavertrio præsenterer sig meget dansk, meget følsomt..."
"The superb performances and outstanding recording make this debut CD hard to resist, and the Lange-Müller is an absolute gem. Add the spontaneity and immediate melodic appeal of the other works included here, and it provides the perfect introduction to the genre’s growth in Denmark." "If you’re familiar with Denmark’s rich musical heritage, then you might already be pre-disposed to give this release a listen. If not, then let me encourage you to do so." "Det er en fin indspilning, der både introducerer et nyt fint kammerensemble og giver en række halvglemte danske værker fornyet liv." "The piano takes prominence in the sound picture, which would be more frustrating were Katrine Gislinge's playing not so full of fluency and tenderness." I. Moderato con moto 14:38 12,80 kr. II. Allegretto piacevole – L’istesso tempo (scherzando) – Tempo I 7:44 9,60 kr. III. Allegro con brio, ma non troppo presto 9:17 9,60 kr. I. Allegro animato 9:05 9,60 kr. II. Allegro molto vivace 3:33 6,40 kr. III. Andantino 3:14 6,40 kr. IV. Finale: Allegro con fuoco 6:08 9,60 kr. Adagio – Allegro con fuoco 12:06 12,80 kr. Andante molto 9:05 9,60 kr. The piano trio was a genre that took a long time to reach Denmark from Central Europe. The many trios by Haydn, Mozart and Beethoven did not immediately prompt Danish composers to try to create anything similar. Not until the middle of the nineteenth century did something begin to happen. 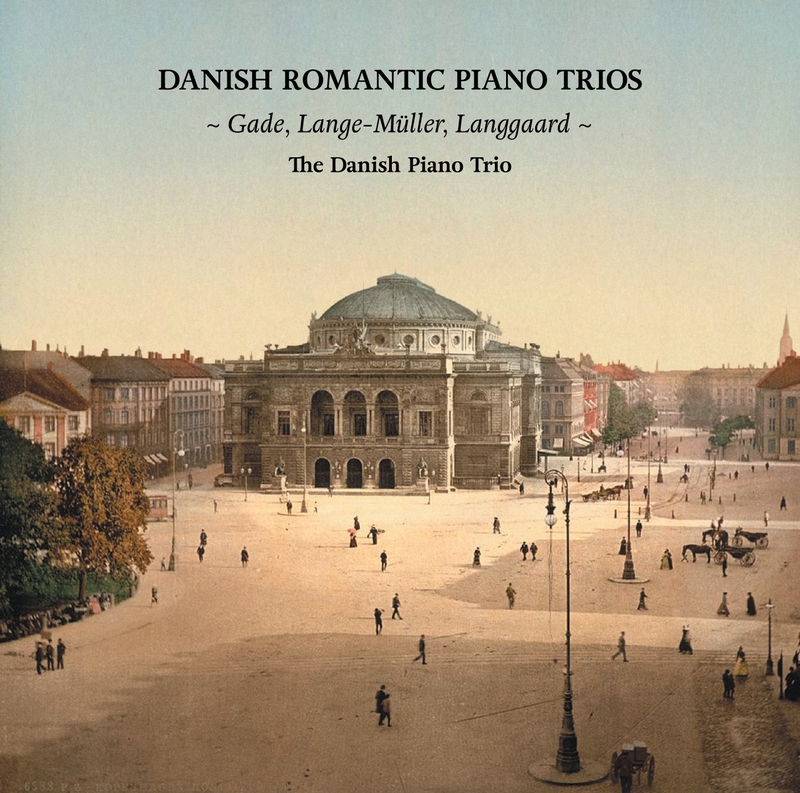 One of the best Danish Romantic piano trios was written by Niels W. Gade in 1862-63. As a young man he had been encouraged by Mendelssohn, who gave his folksong-inspired First Symphony its first performance in Leipzig in 1843. Gade settled down in the city, became Mendelssohn’s assistant and after his death in 1847 his successor at the head of the Gewandhaus Orchestra. But with the outbreak of the first Danish-Prussian War in 1848 Gade returned to Copenhagen. Soon he even began to turn away from precisely the ‘Nordic sound’ that had capti­va­ted the Germans so much. Schumann was one of the first to warn against the limitations of National Romanticism: “One should urge all artists first to achieve originality and then to discard it, to slough it off like a snake when the old skin grows tight,” he wrote. With this advice in mind Gade became careful with the dosages of his ‘Nordic’ effects. Among his chamber works are three violin sonatas, three string quartets, a string quintet, a sextet and an octet. He was himself an able violinist, and Schumann noted that Gade’s surname prophetically consisted of the names of the four notes of the violin strings. On the other hand he was no great pianist. But that did not prevent him writing excellent chamber music with the piano. The Piano Trio in F major op. 42, the second work on this recording, was written when Gade was at the peak of his career and had both experience and vision. Typically for his mature style it is a suc­cinct work with a classicizing balance between form and expression. The first movement has Gade’s characteristically fresh, appealing charm. Discreet rhythmic shifts in the phrasing help to prevent the conservative form becoming academic. The two middle movements are very concise: the second movement is an elegant Scherzo, while the melancholy third movement with its 9/8 time recalls a “Lied ohne Worte”. It continues attacca-style into the final movement, which is rhythmically striking with double-dotted figures and the character designation “con fuoco”. Gade’s only piano trio is perfectly balanced from start to finish. Several decades earlier Gade had made an attempt in the piano trio genre – as one of the first composers to do so in Denmark. The project was not carried through, but what he did manage to write is still fascinating. As the layout for a planned trio in B flat major he drew up a detailed plan in 1839 – in words. The trio was to follow a pro­gramme in four movements where quotations from German poetry were the artis­tic fixed points. The narrative framework is about a hero who sets off in the first movement, is missed by his loved ones in the second movement, experiences danger in the third movement and returns home in the fourth movement. The content-rich first movement is explicitly described in Gade’s notebook: first an Adagio introduction with the motto “Wir sitzen so traulich beisammen” (taken from a poem by Kotzebue). Then an Allegro section where “The hero sets out”, and one hears the “struggle of his loved ones with their emotions and agita­tion”. Their “persuasion and prayers” are met with “resolute resistance”, and the hero goes off. “A march tempo sometimes filters through very faintly”. Gade successfully used the model with a written conceptual basis when he com­posed his Piano Sonata and his First Symphony from the same period. But he did not adhere to the plan for the Piano Trio in B flat major. The score for the sec­ond movement was not fair-copied, the third movement was only sketched out, and the final movement was apparently never begun. It is interesting to follow the movement with Gade’s – hidden – plan in front of one, but as with all good programmatic art the music is not dependent on the model. The B flat major movement is grandly conceived, inspired music, and it is a shame that Gade did not complete the rest of the work. Niels W. Gade held sway as a ‘godfather’ of Danish music until his death in 1890. He left a gap in Danish musical life, not only as a working composer but also as a guiding arbiter of taste. The next few decades were musically rather diffuse in Den­mark. It took some delay for a true Late Romanticism to emerge in Danish music, while at the same time Carl Nielsen gradually gained a foothold with his quite different style. Among the most popular Danish composers at the turn of the century was Peter Erasmus Lange-Müller, a sensitive soul from a fine old Copenhagen family. Lange-Müller had achieved great success with his lieder, small piano pieces, and the music for the folk tale drama Der var engang (Once Upon a Time) (1887), but he had higher ambitions, and went through torments in the attempt to fulfil them. This was due partly to his lack of experience with large formats (Lange-Müller was self-taught), partly to a morbidly low self-esteem and lifelong health problems. But there is no reason to look down on his lovely Piano Trio, which opens this CD. It exhibits the best sides of his melodic talent and his ear for harmony within the framework of a fully developed chamber work. He wrote the Piano Trio in 1890, when he was living in Stockholm and associated with his Swedish colleagues Tor Aulin and Emil Sjögren. The trio was not printed until 1898 and was not played in public until 1900, and by then Lange-Müller, acknowledging the advent of a new era, was already retiring. It is dedicated to Aulin, who was also a violinist, and Wilhelm Stenhammar, Sweden’s great rising composer, who was also a pianist. Lange-Müller felt for once that he was a match for others. The first movement has his favourite time signature 6/8, where the chromatic restlessness and brooding tempo create a sombre starting point. This leads to a melan­choly second subject which gradually brightens up and takes on a surprising whiff of Paris. The well-heeled Lange-Müller was a great traveller, and on the whole his music often seems more French-inspired than influenced by the usual German taste that predominated in the Nordic countries. The second movement is archetypical for the composer, an inter­mezzo that is all loveliness, and whose middle section bears the marks of both Nordic folk music and the old style. In the last part of the movement the two subjects merge. The third movement is the fast final movement in which chromaticism, stormy figures and the second sub­ject in A minor keep one waiting for the resolution in F major. The triumphs are hard-won for Lange-Müller. “Twilight is and will remain my life,” was his apt self-description, and it could also serve as his artistic motto. The short piece Mountain Flowers was written in 1908, when Rued Langgaard was just 15 years old. And there was much more where it came from. Langgaard was about to bring forth his First Symphony, and in an orchestrated version Mountain Flowers forms the second of the symphony’s five movements, In 1913 the whole gigantic work was given its first performance by the Berlin Philharmonic and conductor Max Fiedler. The symphony, which many years later was given the title “Rock Pastorals”, describes human endeavour symbolized by the climbing of a mountain from the foam-lashed rocky coast to the highest peak from which one can look out into infinity. In this context Mountain Flowers is a meditation along the way in which the greatness even of nature’s smallest creations is admired. With this expressive, Wagner-inspired movement, written by a true child prod­igy, we stand at the beginning of one of the most unusual Nordic composer destinies. Just ten years later Langgaard had developed so radically that he reached the boundaries of the Late Romantic universe with his use of atonality and other avant-garde ideas. This was followed by an extended period of regression, as he demon­stratively imitated the style of Gade’s prime, only to go to new extremes in the 1940s with almost absurdist works. Mountain Flowers became one of the last quiet moments before the world was shattered forever for the hyper-romantic Langgaard.